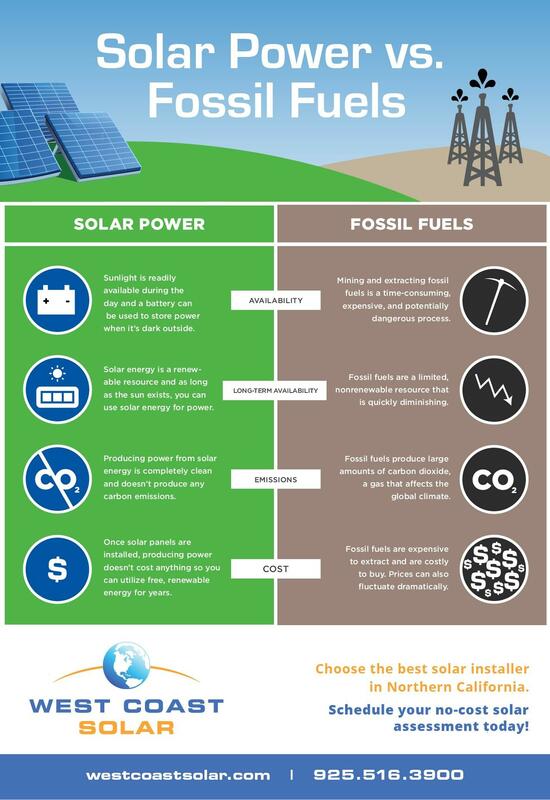 Solar Power vs. Fossil Fuels | West Coast Solar, Inc.
Sunlight is readily available during the day and a battery can be used to store power when it’s dark outside. Solar energy is a renewable resource and as long as the sun exists, you can use solar energy for power. Producing power from solar energy is completely clean and doesn’t produce any carbon emissions. Once solar panels are installed, producing power doesn’t cost anything so you can utilize free, renewable energy for years. Mining and extracting fossil fuels is an expensive, time-consuming, and potentially dangerous process. Fossil fuels are a limited, nonrenewable resource that is quickly diminishing. Fossil fuels produce large amounts of carbon dioxide, a gas that affects the global climate. Fossil fuels are expensive to extract and are costly to buy. Prices can also fluctuate dramatically. Schedule your no-cost solar consultation today!